A social networking service is an online service, platform, or site that focuses on building and reflecting of social networks or social relations among people, who, for example, share interests and/or activities. A social network service essentially consists of a representation of each user (often a profile), his/her social links, and a variety of additional services. For a quick overview of Social Media, I’ve dug out an old classic. We’ve seen, thought and discussed how Facebook & Twitter are changing healthcare. 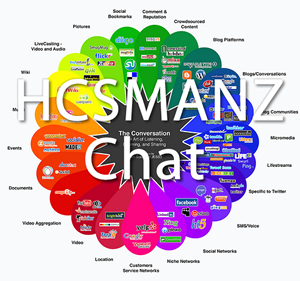 This week on HCSMANZ we ask what other Social Media Services are there? And how can they be used? At the same time we ask the question would the ultimate Social Space be like? Below I've included some services to fuel discussion, but feel free to bring up your own during the chat. Healthysparx (similar to Quora) is a newcomer to the game and is a web app that makes it easy to find answers to your health and medical questions. It has a simple and easy to use interface, and you sign up via email, facebook or twitter. Started up by Aussies, it’s one to look out for in my opinion. PatientsLikeMe offers its members the chance to connect with others dealing with similar issues and research patient data related to their condition. SoberCircle/OneRecovery (For alcoholics and addicts), gives people in recovery the ability to communicate with one another and strengthen their recovery through the encouragement of others who can relate to their situation. DailyStrength is also a website that offers support groups for a wide array of topics and conditions, including the support topics offered by PatientsLikeMe and SoberCircle. SparkPeople offers community and social networking tools for peer support during weight loss. Medpedia - An open access online medical wiki encyclopedia with a social component. A complete list of Social Networking Sites is available from here.